We found several great infant car seat and stroller combinations that we think you'll love! Many of these models appear in our best car seats and best strollers lists. As it turns out, it wasn't good enough to simply be a great car seat and a great stroller; instead, the two needed to be perfectly compatible and versatile, which turned out to be a lot to ask! Below we list our top 5 travel systems, and then we go into our detailed hands-on reviews of several different models. As always, if you have any questions or comments, send us a message via our Facebook page! Here are the Best Travel Systems of 2019! 1. 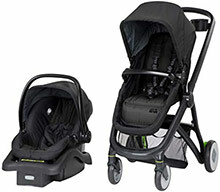 Britax B-Free and B-Safe Ultra Travel System. What do you get when you combine the top-rated Britax B-Safe 35 infant car seat with the awesome all-new Britax B-Free stroller? You get a winning travel system that is truly awesome in every way. The car seat itself is truly amazing, feature-rich, and carries the Britax USA reputation for safety, reliability, versatility, and quality. Made right here in the USA, the B-Safe supports babies at little as 4 pounds and as heavy as 35 pounds (or 32" height). The car seat is a little bit heavier than most options, but that's because it has a steel-reinforced frame, substantial side-impact protection, and EPS energy-absorbing foam. Safety always comes first and foremost with Britax, and the B-Safe is their flagship car seat and holds a fantastic crash test and safety reputation. Only downfall is that it doesn't have an anti-rebound bar (but check out the new and compatible Britax base with anti-rebound bar), and it's a bit cramped in the shoulder area for bigger babies. Now for the stroller. The B-Free is the newest addition to Britax USA's excellent line of strollers, including the B-Agile (good price), B-Ready (good versatility), B-Free (best all-around), and B-Lively (good lightweight option). The B-Agile has been at the top of our best strollers list for a couple years, and is worth every penny; the B-Free is their newest addition and builds upon the success of the B-Agile. It's a really fantastic stroller. It reclines virtually flat so it's great for using with infants, and it supports all the way up to 65 pounds! It has an insane number (seven!) of storage pockets, a huge canopy, big sturdy stance and all-terrain wheels (with a locking front wheel), adjustable handlebar height, a huge UV-protective canopy, suspension on all three wheels, and a really huge storage basket that you can access from the front (!) or back. We really loved the folding mechanism of this stroller, which is truly 1-handed operation (push a button on the side and then grab the handle at the back of the seat and pull up, super easy), and the 21-pound weight makes it more manageable than other strollers with this feature list. It's also really easy to push and steer with one hand, which is nice given that there's no cup holder to hold your coffee! Some cool things we found were the hidden zipper pocket underneath the foot rest area, which you flip up to access the storage bin, the zip-open canopy extension that made the canopy truly huge, and the zip-open peek-a-boo window. Attaching the car seat to the stroller is super easy - the travel system comes with two car seat adapters, one for each side of the stroller. Once you snap the adapters on, you can leave them on for as long as you need and the car seat very easily snaps into and out of it. It worked like a charm, and were super impressed with this combination! Definitely worthy of this top spot on our list, though it is a bit pricey coming in at about $450. Interested? 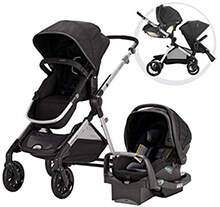 Check out the Britax Travel System here. 2. 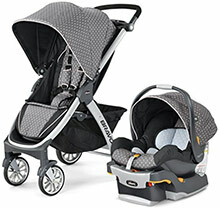 Chicco Bravo Trio Travel System. The Chicco KeyFit 30 is one of the best infant car seats on the market, next to its new sibling, the Chicco Fit2. Take that awesome KeyFit car seat and combine it with the versatile Chicco Bravo stroller, and you have an awesome combination. What makes this travel system different is that the stroller can be used in several ways. When your baby is too little for the big stroller, you can completely remove the stroller seat and use it as a lightweight frame for attaching the car seat. Or, you can leave the stroller seat attached and use the huge canopy to completely cover the car seat and your baby. So the stroller can function as simply a stroller frame for connecting the car seat, or as a complete stroller that can also have the car seat attached. That's an awesome feature and we really appreciated Chicco's ingenuity. A couple other things make this stroller stand out, including the cup holder and parent tray, all-wheel suspension, adjustable handlebars, large storage bin, decent canopy, and one-handed folding (the handle is under the seat). The car seat supports infants as small as 4 pounds and as heavy as 30 pounds, and the stroller supports kiddos up to 50 pounds. The car seat is amazing, safe, and overall great quality; it's been at the top of our best infant car seat list several times, and for good reasons. It's a hair smaller and lighter than the B-Safe, and some of that weight savings is by not having a steel-reinforced frame, though it does use energy-absorbing foam, side-impact protection, and an easy installation process. The KeyFit 30's big brother, the Fit2, has some overall better features and specifications (see our review of it here), so if you prefer that seat you can buy it separately and attach it right to the Chicco Bravo frame. Speaking of attachments, the travel system comes with a car seat attachment bar that looks a bit like a bumper bar, that the car seat attaches and detaches super easily to. No issues there, and we loved the versatility of this combination! A bit less expensive than the Britax travel system, coming in at around $380, but definitely not cheap! Interested? 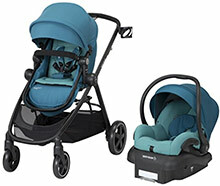 Check out the Chicco Trio Travel System here. 3. UPPABaby Vista & Mesa Travel System. The UPPABaby Travel System is definitely one of the sharpest-looking travel systems on the market, with the sleek urban lines and aluminum on the Vista stroller, and the high-end detailing of the Mesa car seat, this is some head-turning baby gear. And you'll pay for it! This UPPABaby travel system is the most expensive on our list, coming in at abour $1300 for the stroller, car seat, and carriage bassinet. We'll let you decide whether it's worth it, but while it's a big investment, you're getting some really big features and luxury. Starting with the Mesa car seat, which is usually around $300 itself, this is a top-rated car seat that is usually listed around #5 or so on our best infant car seats list. And for good reason. It's one of the easiest to install and use car seats we've ever tested, with its auto-tightening LATCH system, seat belt lock-offs, adjustable recline base, easy-to-use level indicators, and its no-rethread shoulder harness. For safety, it has a double layer of side-impact protection, EPS energy-absorbing foam, supports babies from 4 up to 35 pounds rear-facing, but it has no steel-reinforced frame. In our testing we found it super comfortable and easy to use, with premium quality throughout. We didn't like that all of our test babies had sweaty backs after sitting in it during the warmer months, and the canopy doesn't provide nearly as much coverage as some of its competitors. How about the stroller? It's one of the best strollers in existence, though it is quite expensive. It's got class, style, durability, reliability, and versatility. It's truly a one in a million stroller, and if we could take the Chicco Fit2 or Britax B-Safe and combine it with this stroller, we would be like kids in a candy store! The stroller has an enormous canopy, a big storage bin, reversible seat (front-facing or parent-facing), and extraordinary versatility. It can be used with the carriage alone, with the toddler seat, or with the car seat that snaps in without any adapter. Or, it can be used with TWO kids! I know, it blew our minds too. You can do two car seats, two toddler seats, a car seat and toddler seat, two carriage bassinets, and several other configurations. It has amazing versatility, and that baby carriage attachment is second-to-none. In our testing, we fell in love with the stroller and we don't know how we've survived without having it in our lives! This is really the travel system of dreams, save for some minor limitations of the car seat, and the extravagent price. But if you can afford it, we say splurge! But until they axe that price in half, it won't be at the top of our list! Interested? Check out the UPPABaby Travel System here. 4. BOB Rambler Travel System. 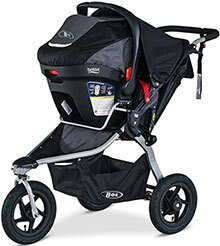 The BOB Rambler is the only high-end jogging stroller travel system on our list. 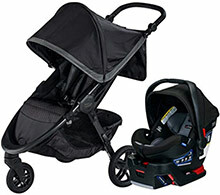 It combines the top-ranked Britax B-Safe with the top-ranked BOB Rambler jogging stroller. And it's not just a great-looking jogging stroller, it's actually built for high endurance jogging and has some serious chops! So whether you want to look sporty, have aspirations to start running more after delivering your baby, or you are an avid runner, this could be the perfect option for you. We've already said enough about the Britax B-Safe 35 infant car seat; it's amazing, and you know how we feel about it. Check out our review of the Britax travel system up above if you want some reminders. So let's focus on the stroller. It's a beast. It's super sturdy, well-made, and looks great. It's comfortable for toddlers and older (up to 75 pounds weight capacity, or up to 44" tall), feels fantastic during use, is easy to control, has large-diameter rubber wheels with a locking front wheel and suspension, and has a decent-size storage bin. It's not quite as intense as the BOB Revolution jogging stroller, but it's also a bit more affordable (about $359 itself), lighter, and folds into a smaller footprint. To attach the car seat, the travel system includes the BOB adapter bar that attaches to the stroller. Once that's attached, it's very easy to get the car seat on and off the stroller, and we liked how you can use both canopies to completely cover your baby and protect them from wind or rain. And if you run like the wind, you'll want them protected from the sonic boom. Jokes aside, this is an awesome combination and the perfect jogging travel system for people looking for this type of versatility. It's usually about $600 or so, which is a bit pricey. Interested? Check out the BOB Rambler Travel System here. 5. Maxi-Cosi Zelia Travel System. Maxi-Cosi, as the name suggests, makes some of the coziest baby products on the market, including their adorable and comfy infant car seats (the Maxi Cosi Mico Max) and the super versatile and luxurious convertible car seat (the Maxi Cosi Magellan Max). But comfort is not the only thing they do right. Their products are well-made, high quality, safe, and versatile. And this Zelia travel system is no exception. While the Maxi Cosi Mico infant car seat is on our best infant car seat list, it isn't near the top of our list. That's mostly because we found things a little finicky, cumbersome, and too pricey for our tastes. But to be fair, it's in the top 10 for the year, making it a really great option. It supports babies from 4 to 30 pounds (or up to 32" tall), has big inflated side impact protection, EPP energy-absorbing foam, and it's actually pretty lightweight given its relatively bulky footprint (mostly in its width). While the canopy of the car seat isn't great, the canopy of the Maxi Cosi stroller is pretty impressive. In fact, there are a ton of things that are really impressive about this stroller. First, the seat can be folded down into a lay-flat carriage bassinet for your baby. Second, the seat is completely reversible so your baby can face forward or backward. Third, it supports babies as small as 5 pounds and kiddos up to 50 pounds, which is a pretty respectable range. It also has a cup holder, a huge canopy (did we say that already!? ), a peek-a-boo window, a well-sized storage bin, one-handed folding, a bumper bar, and decent recline. There were some limitations, however. First, it was a bit of a pain getting the car seat to attach and detach from the stroller because it requires really good hand-eye coordination to attach it, and then two hands to detach it from each side. Second, it was nice that it was a little lighter-weight than some others on this list, but it also didn't feel as sturdy or well constructed as others. And that's unfortunate because it's about $400 for the travel system, and that's a lot to cough up. Interested? Check out the Maxi Cosi Zelia Travel System here. 6. Baby Jogger City Mini Travel System. 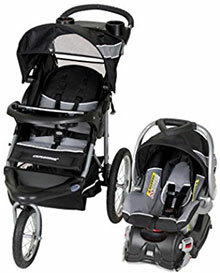 Baby Jogger is well-known for their awesome City Mini, City Select, City Tour, and City Summit (jogging) strollers. But they aren't so big in the car seat market, though their City View convertible car seat has some pretty good review (including ours!). This travel system comes with the Baby Jogger City Mini GT, their most popular and one of their most expensive strollers. The City Mini GT is stylish, versatile, high quality, easy to maneuver, and comfortable for the littles. It is ranked in the top 5 for the best luxury strollers of the year, given its easy fold, sturdy and durable build quality, adjustable handlebar, big all-terrain tires, large canopy coverage (and peek-a-boo window), and the super high weight limit of 65 pounds. In our testing, we loved the hand-brake (rather than foot brake), how easy it was to steer, the super comfortable seat, and the one-handed fold. But we didn't like that it has no cup holder and minimal storage, including a somewhat sub-par bottom storage basket. We also didn't like that everything seems like an add-on for more cost - like the parent tray, cup holder, car seat adapter, child tray, rain cover, etc. It's expensive as-is (about $330), and it really starts to add up when you add in accessories. Relative to the regular City Mini, the GT version brings the higher weight capacity, the hand brake, adjustable handlebar, and big wheels; so a lot of what we like is bound specifically to the GT model. So, there's a lot to like here, but also some limitations that keep it from ranking higher in our lists. By default, the City Mini stroller is compatible with the Baby Jogger City GO infant car seat. The City GO is a pretty decent car seat, and this was the first time we actually got our hands on it for testing. It supports babies from 4 to 35 pounds (or up to 32" tall), and has nice plush infant inserts. The fabric itself is great, and the padding is substantial. We liked certain things - the seat area itself is nice and wide, when placed on the floor is has a rounded base so parents can rock it front-to-back, and the base and car seat aren't excessively wide. But we didn't like a few things. First, it felt a little out-dated relative to the top-rated Britax, Chicco, UPPABaby, and Peg Perego car seats. Second, clicking it into and out of the base, or attaching/detaching from the stroller wasn't anywhere near as easy as the higher-rated travel systems (above). Third, the canopy was large but also a little clumsy - it clicks loudly and has a crunchy fabric noise when you're adjusting it. Fourth, adjusting the harness didn't involve rethreading (which is great), but it also was a total pain to adjust since you need to do it from the rear. And we couldn't figure out how to remove what we assumed was the upper infant insert padding (around the shoulders and head), but it doesn't come out and makes it really cramped once our test babies were over about 4 months old. Together, those are some big limitations for an infant car seat priced around $230. So what are the other options? If you really like the City Mini GT stroller, you can purchase an adapter to make it work with your favorite car seats. For example, there's an adapter for the Britax B-Safe, the Chicco KeyFit or Fit2, the Peg Perego Primo Viaggio, and the Graco SnugRide Click Connect models (see all their adapters here). That was smart of Baby Jogger, to provide so many adapters to make it possible for parents to purchase one of the best strollers on the market (the City Mini) and couple it with their favorite car seat (which was not likely to be the City GO). And that's also one of the reasons we've included this travel system up here on our list, since the City Mini stroller has so many compatibility options that make it a potential winning situation for picky parents who want to mix-and-match! Interested? 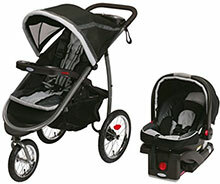 Check out the Baby Jogger Travel System here. 7. 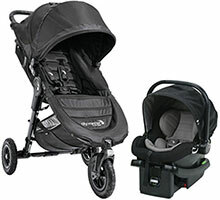 Evenflo Pivot Xpand Travel System. We've always associated Evenflo with inexpensive baby gear that was never really impressive in any given way. Our experience with the Evenflo Pivot Xpand travel system changed our opinion for the better. We were super impressed with what Evenflo pulled off here. They made a trully impressive travel system that not only feels, looks, and acts like a much more expensive stroller and car seat combination, but is available for about $390. We realize that seems expensive for an Evenflo travel system, but hear us out! This system combines the great Evenflo SafeMax infant car seat (usually about $180) with the new and super versatile Pivot Xpand stroller. Add those two together and you end up with a truly awesome travel system that caught us off-guard! Where do we start with this stroller? Evenflo pulled out all the stops. This stroller has a super rich feature list: adjustable handlebars, a HUGE lower storage bin, self-standing fold, rear-wheel suspension, cup holder, and versatility that makes any stroller on this list look like a chump! This stroller has 22 different modes and functions as both a single stroller and double stroller, combining the infant car seat and toddler seat in tons of different ways. The fact that it can work as a double stroller is why they call it the "Xpand" system, a little bit like the Britax "B-Ready" system, and it defies the assumption that double strollers need to be huge and cumbersome. Not this one. Here are some of the things we loved: the toddler seat can be reversed to be front-facing or parent-facing, or it can be reclined back to make it more like a baby carriage. And it can be put up front or lower down, without using any adapters. That's right, the adapters are built right into it, which is truly amazing! We never thought we'd be saying this about an Evenflo product, but this stroller really rocks, and feels high quality and sturdy, and looks super chic and modern. One of our reviewer moms wrote "this stroller is dope, can I buy this sample?" And that's a ringing endorsement from a mom who uses the UPPABaby system that costs 3x as much. The only thing we'd suggest to Evenflo is to make the tires a bit thicker and better quality, they are somewhat thin and cheap and therefore puncture pretty easily (they're not full of air, so note that they don't deflate in this situation). So how about that car seat? This travel system includes the Evenflo SafeMax, which is their top of the line infant car seat. It supports babies as small as 4 pounds (with the infant insert) and as heavy as 35 pounds (or up to 32" tall). What makes it so safe? Well, it has big side-impact protection and is the only car seat that has been roll-over tested, so kudos to Evenflo on that one. It also has an anti-rebound bar, which reduces rotational forces and potential for injury in the event of an accident. And it's very comfortable, with thick padding and soft-touch fabrics that are also pretty easy to clean. Installation was easy, it was easy to attach and detach from the base and the stroller, and we thought the seat actually felt very high quality and we were impressed overall. Cons? Well, the handlebar was a bit cumbersome to adjust, the shoulder harness required rethreading from behind to adjust, it's surprisingly heavy, and it's just not up to par with the Britax, Chicco, or Peg Perego car seat options. So there's a lot to love here, especially with the stroller, and we think you'll be happy overall with this travel system. We're going to test it out for a few more months and see how reliability goes, it might creep higher on this list over the longer term! Interested? Check out the Evenflo Pivot XPand Travel System here. 8. Safety 1st Riva Travel System. Safety 1st makes some great strollers and infant car seats with good features and safety at very reasonable prices, making this one of the best bang-for-the-buck travel systems available. Safety 1st sent us this system in late 2018 for testing, and we were pleasantly surprised. Especially for the price, coming in at around $299 for what amounts to being a super versatile system, especially the stroller. Let's start with the Riva stroller, which is really impressive. It's made with 85% recycled materials in a zero-waste facility right here in Indiana, USA, making it one of the "greenest" travel systems on our list. Out of the box, assembly was super easy, and folding/unfolding the stroller can be done one-handed. We are fully impressed with the fact that the toddler seat can be converted to a fully-flat bassinet carriage, or can be completely removed so you can use the stroller frame with the attached car seat only. The toddler seat, bassinet, and car seat can also be positioned forward-facing or parent-facing, thus the 6-in-1 claim. The stroller supports babies as small as 4 pounds (in bassinet mode), though we couldn't find a maximum weight or height limit for the stroller; we suspect it's a bit lower than others on this list, because the toddler seat space is a bit cramped for kiddos over about 3 years old. The stroller itself is one of the lightest around, coming in at only 18 pounds, making it easy to carry when folded, super maneuverable, and easy to travel with. We also loved how big the lower storage bin is, the cup holder, and how easy it was to clean the fabric surfaces. Cons? Well, some of our testers thought that the plastic felt a little flimsy and unfinished relative to other strollers, and that folding it (collapsing it) wasn't as easy as they thought it could be. Now, let's consider the car seat. This is the biggest challenge with this system. We do love the Safety 1st Onboard 35 Air car seats, which appear on our best infant car seat lists. But this travel system comes with the Onboard 35 FLX, which is not even listed on Safety 1st's website. It's basically a bare-bones version of their best-selling car seats, and has some big limitations as a result. Let's start with the good stuff - the car seat supports babies as small as 4 pounds (using the included infant insert) and up to 35 pounds, it has a 5-point harness, side-impact protection, and is super lightweight. It does click easily into and out of its base, and we had no major complaints other than the fact that it's super basic and lacks many features of higher quality car seats (including their own). The shoulder harness requires rethreading for adjustment, the crotch buckle is in a fixed position, the handlebar is stiff and somewhat uncomfortable to carry, the seat padding is thin, there is no steel-reinforced frame or anti-rebound bar, and the canopy leaves something to be desired. So the question is whether you can combine the Riva stroller with one of their higher quality car seats? Yes, the higher-end Onboard 35 Air car seats fit the stroller, but it doesn't seem like you can purchase the stroller without it being part of the travel system. Interested? Check out the Safety 1st Riva Travel System here. 9. Graco FastAction Fold Travel System. Graco is famous for their expansive line of SnugRide Click Connect infant car seats. In fact, the assortment of SnugRide car seats is so expansive that it confuses the heck out of parents, so much so that we created our SnugRide buying guide to help clarify the features and cost of each model. This Graco travel system includes the SnugRide Click Connect 35, which is the most basic of the SnugRide car seats. Let's start with what it has: a broad weight range from 4 to 35 pounds (or up to 32" tall), a narrow (just over 18" wide) and lightweight (7.5 pounds without the base) shell, 6 recline positions, side-impact protection, energy-absorbing foam, the Click Connect system that makes it super easy to snap into and out of compatible Graco strollers, and it's FAA approved for air travel (just like all of the car seats on this list). Now let's consider some of this car seat's limitations: the harness requires rethreading from the rear for height adjustment, it uses old-style hook LATCH connectors, it doesn't have the rapid remove cover, nor does it have the True Shield or Safety Surround side impact protection. Like we said, it's a pretty basic car seat. Some minor annoyances with it include the smaller than ideal canopy, the somewhat flimsy padding and infant insert, and the handlebars require two hands to adjust. So you're getting an overall very basic car seat that usually sells for around $130. Now for the stroller. This thing is very heavy and sturdy, coming in at a hefty 30 pounds that rivals even some of the biggest double strollers! But we do admit that while all that weight makes it cumbersome to lug around, it actually makes it feel very firmly planted on the ground, which is a nice feeling. It has pretty large diameter wheels, and the front wheel can be locked out for jogging. We love the fact that it has two cup holders for parents, a tray for your cell phone (though it's a little small for some newer devices), and a little comparment for holding keys and anything else you can squeeze in there. Your child has a pretty similar bumper bar and tray, also with two cup holders and a little tray in the center. The best part of that is you can open one side of it and swing it out of the way, which made it much easier to pull toddlers in and out of the stroller. You can also remove that bumper bar entirely, but that makes it impossible to attach the car seat since it's part of the Click Connect attachment. It has a good-sized storage bin on the bottom, folds easily with one hand (though it's super heavy), reclines reasonably well (but nowhere near lay-flat, only about 45 degrees), and it supports kids up to about 50 pounds. Not bad for a stroller that amounts to only about $160. Cons? Well, in addition to being excessively heavy, it doesn't fold down into a very compact package. You need to have big biceps to lift it, and a big vehicle to fit this in, and that's not helped by the fact that the rear wheels are so big and don't quickly detach like some other models. And frankly, it's not so easy on the eyes - it doesn't look anywhere near as nice as the $90 more Evenflo. So overall, you're getting a jogging travel system for less than $300, which is about half the price of the BOB jogger (above). So if you're looking for a jogger travel system for a reasonable price, this could be a great option. Interested? 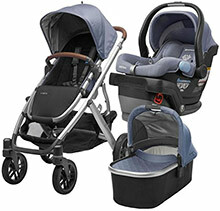 Check out the Graco FastAction Travel System here. 10. Baby Trend Expedition Travel System. If you're looking for the cheapest jogging travel system with a decent quality jogging stroller and a super basic car seat, this might be a great option for you. This Baby Trend travel system screams basic, and the low (about $199) price tag is evidence of that. Starting with the stroller, this travel system uses the Expedition Jogging Stroller, which is down near the bottom of our best jogging strollers list. It's not bad, it's not great, but it really is a sweet deal for parents looking for a basic jogging stroller. There are some impressive things going on here: it has very large diameter rubber pneumatic tires that are 16" (front) and 12" (rear) in diameter, which is actually quite large and that makes it great at absorbing small and moderate bumps, and going over cracks and gaps in the sidewalk without any issues. It also has cup holders and a small cubby for phone and keys, comfortable handlebars, a decently-sized lower storage bin, and a reclining seat (but doesn't go anywhere near lay-flat). Those big wheels make for superior comfort and maneuverability, especially impressive for a stroller this price. There is no front suspension, however, which makes it a bit more jarring over the bumps than most other options on this list. It also doesn't have adjustable handlebars for taller parents, and the seating surface doesn't feel anywhere near as comfortable as other options on this list. Folding it up, it folds into a decent foot-print, but it's still quite large with those hulking wheels popping out from the sides. Now for the car seat, which is the Baby Trend EZ Flex-Loc infant car seat, which typically sells for around $110 or so. That low price always means limited features. It supports babies from 5 to only 30 pounds, and only up to 30" tall. So that's a pretty limited range of height and weight for an infant car seat, making the transition to a convertible car seat happen pretty early for many parents. But to be fair, most toddlers will be itching to get out of this seat anyway, given that it's relatively sparse in its padding and comfort features. It does have side-impact protection and energy-absorbing foam, an infant insert, and a surprisingly comfortable handlebar for carrying. The seat itself is also pretty lightweight, and snaps into and out of the stroller with ease and convenience. So that's all good. So overall, this Baby Trend travel system is the most inexpensive travel system on our list, and it shows in many ways. But it might be sufficient for parents looking to save some cash and get a pretty decent jogging stroller and a super basic infant car seat. Interested? Check out the Baby Trend Expedition Travel System here. When I had my first baby, I bought two top-rated baby products - the Britax B-Safe 35 infant car seat and the Uppa Baby Vista stroller. And I was super excited to get my hands on them and try them out. I ended up loving both of them, they were well-made, nice-looking, safe, easy to use, and reasonably priced. As a first-time mom, I didn't even think to consider their compatibility and ended up stuck with an awesome infant car seat and amazing stroller, but I couldn't use one with the other. After hours unsuccessfully looking for an adapter to make them work together, I ended up just buying a separate universal stroller. I'm happy to say that I still got a few years out of my Vista stroller. All is well that ends well, but I'm not going to let you make the same mistake! The best baby travel systems combine an infant car seat with a perfectly-matched stroller to give you excellent compatibility, versatility, comfort, safety, and cost savings. Ideally, you want to combine the best of both worlds - the best infant car seat and the best stroller, and you want it to be super easy to attach and detach them from each other. To find that perfect combination we pulled together 17 different travel systems and put them to the test. Some were relatively expensive, like the ones made by Nuna, Baby Jogger, Maxi-Cosi, Uppababy, Peg Perego, Britax and BOB. And some were more reasonably priced, like the ones made by Graco, Chicco, Safety 1st, Baby Trend, Evenflo, and Cosco. Did price matter? Yes, it was strongly correlated with quality, versatility, safety, and reliability. In fact, several of the least expensive options didn't even make it onto this list. Mommyhood101 participates in the Amazon Services LLC Associates Program, an affiliate advertising program providing a means for sites to earn advertising fees by linking to Amazon.com. Most product links lead directly to Amazon.com. Complete terms and conditions. Check out our full list of Best Baby Gear!